Welcome to TracfoneReviewer, a blog about prepaid cell phones from Tracfone! Tracfone releases a lot of new phones every year, and it can be hard to keep track of what is new, and what has already been around for a while. When shopping for a new phone, we all want to know which phones were recently released, as these usually have the best features. 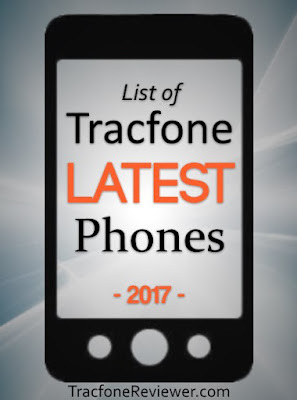 This list contains the latest phones released by Tracfone and we will continue to update as new phones are released each month as we get into 2019. We will include brief descriptions of each new phone, and links to additional information. You can also visit our Cell Phone Reviews page for our latest reviews of new phones.. Starting in April 2017, Tracfone is no longer including Triple Minutes for Life with new phones. Learn more about this, and how it might affect you, in our recent post about the Changes to Triple Minutes for Life. Several new high end phones may be coming to Tracfone including the iPhone 8, iPhone X, Moto G7 and more. We will be adding any information as soon as it is confirmed! In fact, the Unlocked Moto G7 is already available and we've got a full Moto G7 Review with complete specs and more so check it out! We don't always know when some of these phones will be released, but will share as soon as they are. Now let's look at the phones Tracfone has recently released. Below are the latest phones released by Tracfone to use on their prepaid network. This list has the newest phones first, followed by older devices. The MyFlip is, as the name suggest, a basic flip phone released by Tracfone for use on CDMA networks. It has 4G connectivity and basic features one would expect on a flip phone such as a 2 MP camera and a 2.8" screen. The phone will last about 18 days on standby, and is probably best suited for those looking for a backup phone. The Alcatel MyFlip is on the Tracfone website for $20. This Alcatel brand device features a 5.43" touchscreen with 18:9 ratio and 480x960 resolution along with 1.1Ghz processor and 16 GB Storage/2 GB RAM. It is relatively inexpensive for the features, at just $49 retail and often available for less, but this Android 8.1 smartphone doesn't pack a lot of performance and might be best suited to low to moderate users. Find the Alcatel TCL LX A502DL from several retailers including Amazon, Tracfone and HSN. The latest budget smartphone from Motorola is now available directly through Tracfone. The Moto G6 features a 5.7" Full HD touchscreen, Octa-core processor with 3 GB RAM and 32 GB internal memory. It also has dual rear cameras and runs Android 8.0. Unlocked versions of the Moto G6 have been available for use with Tracfone BYOP since the phone was released but now the Tracfone version is available. The Moto G6 is a very attractive phone at a reasonable price and visit our Moto G6 Review for full specs and features. Tracfone continues to update their cell phone lineup with the Galaxy J3 Orbit which has a 5" touchscreen, runs Android 8.0 Oreo and has 16 GB storage and 2 GB RAM. It runs on CDMA networks (Verizon). On paper the J3 Orbit looks a little overpriced compared to other options, and you can see the full details and specs in our Review of the J3 Orbit. The latest phone in the Galaxy J7 lineup, the Crown features a 5.5" HD touchscreen, Android 8.0 Oreo and 13 MP camera. It also comes with an octa-core processor, 16 GB internal storage and 2 GB RAM. It has a variety of improvements over the previous version, but also has a slightly higher price. Learn more and find out where to buy in our Samsung Galaxy J7 Crown Review. The latest version of the LG Rebel comes with a 5" screen, 1.4 Ghz quad-core processor, 8 MP rear camera, and most notably, Android 8.1 Oreo. It also features a removable battery and 2 GB RAM with 16 GB Storage. The Rebel 4 brings modest upgrades compared to the previous version (Rebel 3) and is expected to have two versions, one for GSM and another for CDMA networks. The Moto E5 has a 5.7" screen with 18:9 screen ratio, 4000 mAh battery and runs Android 8.1 Oreo. The unlocked version was only just released in May, 2018, and now Tracfone is offering a slightly modified version as well. The Moto E line is known for good battery life and dependable performance at a very budget friendly price. See our full review of the Moto E5 to learn more! Featuring the largest screen of any Tracfone device, the LG Stylo 4 has a 6.2" FHD touchscreen, 13 MP camera, octa-core processor, 16 GB storage and 2 GB RAM. It also comes with Android 8.1 Oreo which has access to over a million apps on Google Play. It is currently available for CDMA networks. The iPhone 7 and iPhone 6S Plus are both available on the Tracfone website and offer high-end features at a hefty price. The iPhone 7 comes with a 4.7" screen, iOS 10, 32 GB storage and a 12 MP camera. The iPhone 6S Plus features a larger, 5.5" touchscreen, iOS 9, 32 GB Storage and 12 MP camera. Apple smartphones are well known for their impressive camera performance, and these two iPhones are no exception, with the capability of capturing excellent photos and video. Stepping in right between the Rebel 3 and Fiesta 2, the LG Premier Pro has a 5.3" screen, Android 7.1, 16 GB internal storage, 2 GB RAM and a quad core processor. It shares a number of similarities with other recent phones from LG but offers a middle ground in screen size. With a lot of similar specs to the LG Rebel 3 and Fiesta 2, the Stylo 3 does stand out with a large, 5.7" touchscreen. This phone also has 16 GB storage, 2 GB RAM, a 13 MP camera, and runs Android 7.0. The LG Rebel 3 brings several updates to the popular Rebel lineup and is also one of the first new phones from Tracfone in 2018. With a 5" touchscreen, Android 7.0.1, 16 GB storage and 2 GB RAM, it offers great specs for the price - which is currently $59 on HSN with an airtime bundle. Tracfone now offers both a GSM and CDMA version of this phone. The GSM version is only available from the Tracfone Website at this time and we include a link in our review. Learn more about the LG Rebel 3 in our Review. We will continue to add new phones as they are released. 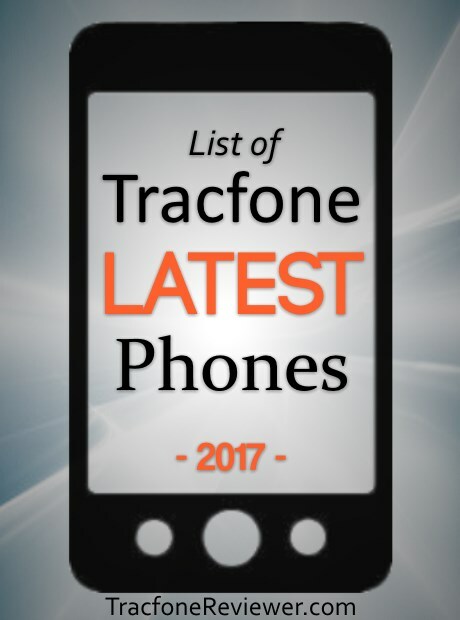 And below are phones released by Tracfone in 2017. Almost identical to the original Fiesta, the new Fiesta 2 comes with 2 GB RAM instead of 1.5 GB. Otherwise it shares the same 5.5" screen, Android 7.0 and 13 MP Camera that also comes with the Fiesta. Find the Fiesta 2 on Amazon for $99. The iPhone SE has the size and feel of an iPhone 5S, while actually containing the internal specs and features of a more powerful iPhone 6S. That includes the very impressive 12 MP rear facing camera, plus A9 processor. The screen size is just 4", which is rather small for a smartphone these days, but this device makes up for it with 32 GB internal memory to store apps and other media. The iPhone SE can be found on the Tracfone website(Last check it was in stock!) and may come with either a CDMA or GSM SIM card depending ont he ZIP code provided. It can also be found for $199 on Bestbuy. The Galaxy Luna Pro (S327VL) is an upgrade from the original Galaxy Luna, and comes with a 5" screen, 16 GB memory, 1.5 GB RAM and Android 6.0.1. It is fairly similar to the Galaxy Sky, but with a slightly faster 1.4 Ghz quad core processor. The one drawback about the Luna Pro is that it does not include Triple Minutes for Life. Learn more about this phone in our Samsung Galaxy Luna Pro Review. Available on Amazon for $109 with airtime bundle. Also available on QVC, HSN and other retailers. Featuring Android 6.0.1 and a 5" screen, the Rebel 2 has several nice upgrades over the original version, the LG Rebel, but also misses the mark in a few key areas. The Rebel 2 only has 8 GB memory (about 4 GB usable), 1 GB RAM and does not appear to include Triple Minutes for Life. It runs on CDMA networks (Verizon) and is available from several online retailers. Also available on Amazon for $79 with $40 airtime card. The ZTE ZMAX Champ comes with a large, 5.5" HD touchscreen, Android 6.0.1 and an 8 MP camera. It only has 8 GB memory, which may be too little for many users. The phone users CDMA networks and includes Triple MInutes for Life. Visit our Review of the ZTE ZMAX Champ to see all the details and how it compares to other devices from Tracfone. Another ZTE phone, the ZFive has a 5" screen, Android 6.0 and 5 MP camera. It also is limited to just 8 GB memory, although there is a micro SD card slot. The ZFive uses CDMA networks and comes with Triple Minutes for Life. The LG Fiesta comes with a lot of great features including a 5.5" touchscreen, Android 7.0, 16 GB Memory, and 13 MP camera. It is a popular choice for the well rounded list of features it includes, except for a lack of Triple Minutes for Life. There are two versions available, one uses CDMA networks and the other GSM. Read our review of the LG Fiesta to learn more about the phone, and buy it on Amazon for $99 with airtime bundle. Another good option, the Sky Pro comes with a 5.5" screen, Android 7.0, 16 GB memory and 2 GB RAM. It is a popular choice despite not including triple minutes. The Sky Pro uses CDMA networks and there are two other versions with smaller screens and different specs also available; the Galaxy J3 Sky and Galaxy J1 Luna. Learn more about the Samsung Galaxy Sky Pro including where to buy. Released at the end of 2016 or early 2017, the Pixi Bond has a 4.5" screen, Android 5.1, 8 GB Internal Memory, 1.1Ghz Quad-core processor and 5 MP rear camera. The Bond is only capable of 3G LTE speeds. It is a very basic smartphone, but comes at an inexpensive price of $30 on the Tracfone website. Released at the end of 2016 or early 2017, the Avion has almost identical specs compared to the Pixi Bond (listed above), but comes with 4G LTE coverage. It has a 4.5" screen, Android 5.1, Quad-core processor, 8 GB Memory and only 2 MP camera. Most Alcatel phones are somewhat cheap and may not be the most durable. The Pixi Avion retails for $40 on the Tracfone website. The Pixi Unite was released at the end of 2016 or early 2017 and comes with a small, 4" touchscreen, Android 6.0, 8 GB Internal Memory, 1.3Ghz Quad core processor and 2 MP camera. The Unite is capable of 4G LTE speeds and has a Micro SD card slot. With the newer Android OS and Micro SD slot, the Pixi Unite is a good value at just $30 on the Tracfone website. That's it for the latest phones, we will continue to add new phones as they are released. Let us know if you see a new phone that isn't on our list! If you're new to Tracfone, Start Here with our beginners guide. Also take a look at our Guide to Activating or Transferring a Tracfone Smartphone for tips and a step by step list. Join our Facebook page where we post the latest news, deals and other information. Plus, if you have specific questions you can send us a message. Learn how to Make your Airtime Last Longer and also check out our recent post on How Data works with Tracfone. What about LG Fiesta, Samsung Galaxy J3 Luna Pro, which I just ordered, Samsung Galaxy Sky, Samsung Galaxy Luna, Samsung Galaxy J7 Sky Pro? Where are those on your post? really amazing, no phone coming out now should have less than 16g memory, a 1.5g processor and HD screens, these things have been around long enough now. As for screen size, 4.5 is good for me, 5 is tops for a phone. I still find this LG Phoenix 2 I picked up on last years Best Buy black Friday sale for 30 bucks is one heck of a "food stamp" phone (so called by the upper Iphone crowd) It has what a phone at that price should all be selling for by now. I use it on TF with one of their SIM cards and it works. After your review on the LG Fiesta, I have been in contact with both LG and Tracfone numerous times about the LGFiesta L63BL. Neither at any point have given me any information about where to purchase this phone. I have even contacted Walmart asking if theirs is unlocked. Where can I purchase this phone because my area only works with AT&T? My LG (AT&T GoPhone) Phoenix 2 that I use on TF as a BYOP came with Android 6, but has been updated to Android 7 since Aug. The BYOP's most likely will get a new OS, the track-phone models won't. iPhone SE $129.00 @ Walmart -- brand new as of 10/25/2017. Comes with a sim card packet stuck on the back of the box for Straight Talk and/or Total Wireless -- Simply Mobile -- Family Mobile -- which are all owned by Tracfone. The one I bought was a Straight Talk/Total Wireless because it was the only one available in black and gray at the time. I'm going to run mine on Tracfone's BYOP-GSM/AT&T towers SIM. While I was at Walmart I bought the new Tracfone SIM kit that has the 3 SIMs for either AT&T, Verizon or T-Mobile towers. The iPhone SE is capable of running off any of the 4 big towers -- GSM (AT&T or T-Mobile) or CDMA (Verizon or Sprint). -- THROUGH TRACFONE NOT CRICKET WIRELESS or T-MOBILE or other cell phone company. I haven't opened my iPhone box yet and don't know when I'll get around to doing it. If anyone else has already done this, please drop a reply. I thought about just buying a cheap junker Tracfone that has a nano AT&T SIM or a micro SIM and cut it down but I figured it would just be cheaper to buy the SIM kit and go that route rather than buying another phone and firing it up and do a SIM swap. Of course I won't ever install the SIM that comes taped to the box (Straight Talk/Total Wireless) I will activate the Tracfone BYOP AT&T SIM and install it into the SE. The iPhone SE at Walmart or BB that has the Straight Talk/and other Tracfone carrier family documented at the top of the SIM pack taped to the iPhone box is technically NOT and unlocked phone for any carrier -- but it is unlocked for most, if not all of the Tracfone owned companies. Google the carriers Tracfone owns -- If you get it at Walmart ask the person in electronics to show you your choice of available colors. They have the phones locked in a cabinet where they can't be seen. All of them will say "Straight Talk" in the upper left hand corner of the SIM packet taped to the back of the box with another Tracfone owned carrier labeled in the upper right-hand side. BTW, you're not ripping off Tracfone -- they're making money no matter which phone or carrier they own you go with. They will not unlock that phone for you to move it to tracfone. That phone is locked into straight talk. A heads up for anyone look at the ZTE ZFive L 4G LTE: Although you CAN install an SD card, it does not allow you to treat that card as internal storage EVEN THOUGH it runs on Marshmallow. I'm not sure which other models were given the same treatment. Has anyone tried the Alcatel ZIP LTE? I see it on Tracfone's website for $49.99 and am considering it as a replacement for my 3-year old Moto E that just doesn't have enough memory space. The specs look pretty good for the very small price. I'm curious about Alcatel phones in general and how they hold up, although for $49.99 I'm terribly worried about it. Thx! According to AndroidCentral, Tracfone is getting the G6, not the G6 Play. I love the zip. Nice 720p display with on screen buttons. Runs on verizon towers. It is slow in terms of processor power. It runs quad a7 which is ancient at this point. I find the build quality better than the four LG phones I've owned over the years. I have heard a problem with the back of this phone being glass, prone to scratching and breaking. Any problems like that discovered? I see today - January 9, 2019 - HSN has a new Tracfone model" the TCL LX A502DL 5.4" 16GB for $49.95. There's no bundled service days or minutes, just the basic 30-day activation. Don't know this make or model, but it says it's 1.1GHz quad-core processor and Android 8.1 Oreo, which are very respectable for the price.